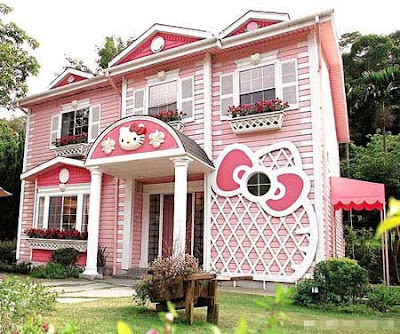 The Hello Kitty Castle, that is. 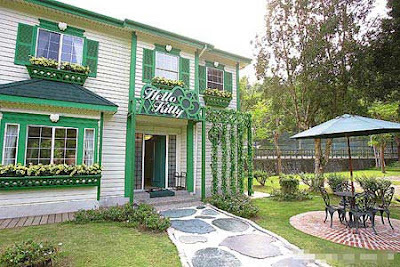 Located in Shangai, China, a rabid fan built this in honor of his favorite character and operates it as a museum. Surprisingly: A popular museum! I think I would put this up there with world's largest ball of twine.... 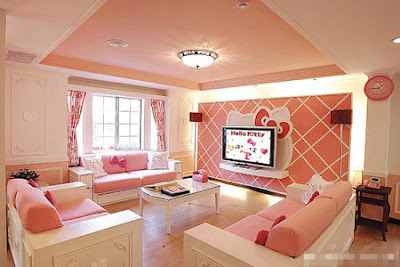 The pink living room. What is that shade? bubblegum? strawberry ice cream? 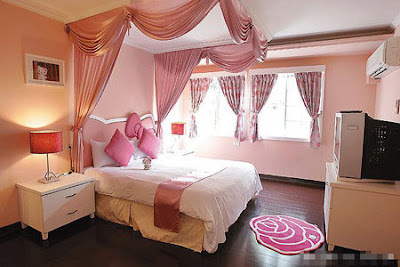 Can you sleep in a room this pink? Scientists want to know. 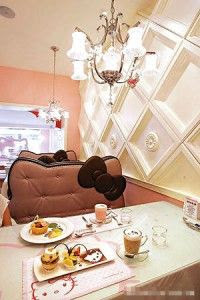 After seeing all of that sweetness, do you really want to sit down to dessert in the dining room? The backyard is a relief in its lack of pink! Can you believe this is in Shangai, it could be Omaha, Nebraska or the like by the looks of the yard. I hope you enjoyed the travel-log! 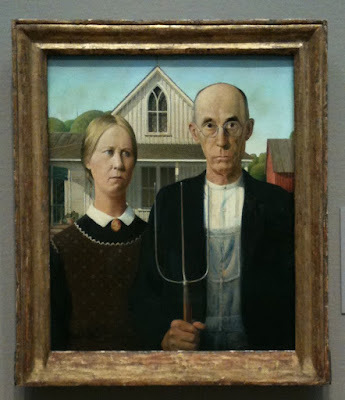 American Gothic, by Grant Wood, has always been one of my favorite paintings. Cliche I know, but I just love it. 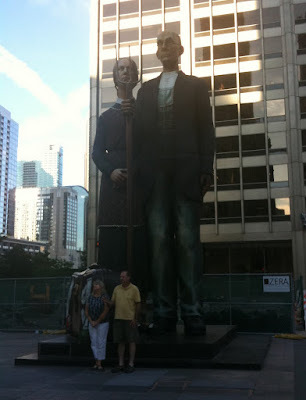 While in Chicago this past weekend I was able to see not only the original painting (1930) in the Chicago Institute of Art, but also a sister work of art from 2005 that mimics it nearby across from the famous Tribune Building. I recently found out that the painting by Wood depicts a farmer and his DAUGHTER, not his wife like I always assumed, according to his sister Nan. He modeled the pair on his dentist, Dr. Byron McKeeby and sister; people he thought looked like occupants of such a house. The original building was in Eldon, Iowa and was painted from memory. The painting was submitted to the institute in a contest and won first place: $300 and a bronze medal. The museum purchased it shortly afterwards and it became one of the most widely published paintings of all history. 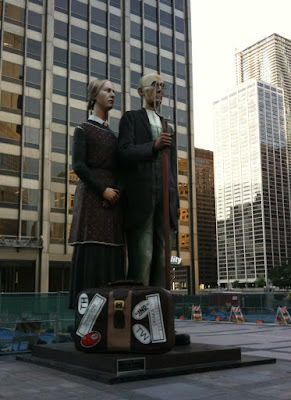 The nearby statue is of fiberglass and was created by J. Seward Johnson (the Johnson & Johnson heir). Measuring in at an impressive 25 feet high, the statue is called 'God Bless America'. Which do you prefer? I've been obsessed with fountains lately. I loved the video feature on the iphone because I collected 10 second clips of every fountain I saw! It was the start of a beautiful collection. Above is the huge fountain in the Memorial park in Crystal City, Virginia along Crystal Drive. Below is the fountain in the garden of the Chicago Institute of Art. For those that asked, I had to get rid of the phone because it did not pick up an AT&T wireless signal in my apartment -in the heart of the city!